The nutcrackers from the Erzgebirge have achieved exceptional fame and popularity. Figuratively designed nutcrackers did not appear in the Erzgebirge before the mid-19th century, at least there is not any evidence in sample books, price lists or any originals from this era. However, their predecessors can be found in the nodding figures from the Rhön region, the Oberammergau jumping jacks and the grotesque figures from Gröden in Northern Italy, which are all figurative representations and equipped with a moving lower jaw. It is also possible that the Thuringia nutcrackers, in existence since 1735, served as inspiration. 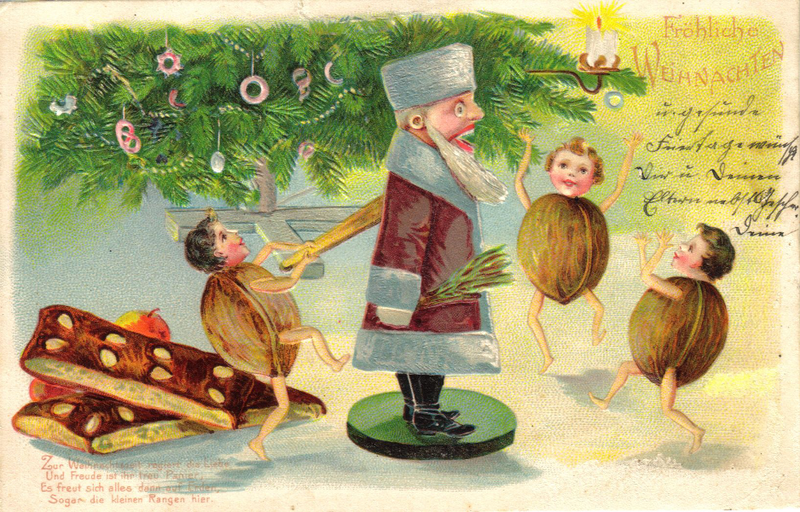 The fact that nutcrackers are associated with Christmas may be due to their increased use for baking during the Christmas period. The first Erzgebirge nutcracker turned on a lathe, in the style so famous today, was created around 1865 in the workshop of Wilhelm Friedrich Füchtner (1844-1923) when trying to reproduce the nutcracker from Heinrich Hoffmann’s story “King Nutcracker and Poor Reinhold” (1851) out of spruce wood. The result was the prototype of the nutcracker “King”. Füchtner’s nutcrackers are distinguished by their clear basic shape and the characteristic painting in red and yellow or blue and orange. The tunic is decorated with simple dots and line ornaments. The King’s headgear is the same shape as the miner’s pit hat, which is turned into the King’s crown by the golden notches painted on it. The eyes, moustache and feet used to be moulded out of bread dough. Rabbit fur was mainly used for the beard and hair. Besides the King, grim and gruff soldiers, foresters, policemen and firemen were developed as symbolic representatives of the classes issuing orders, who literally “had tough nuts to crack”. However, kind figures from everyday life or stories also enriched the range on offer. 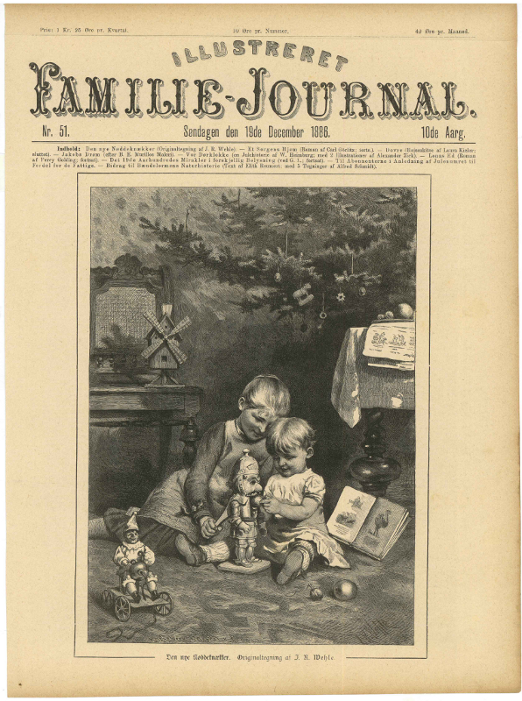 Famous nutcracker manufacturer names from the early days are Louis Gläser and Otto Ulbricht, whose families are still in business today and have retained the individuality of their nutcrackers. 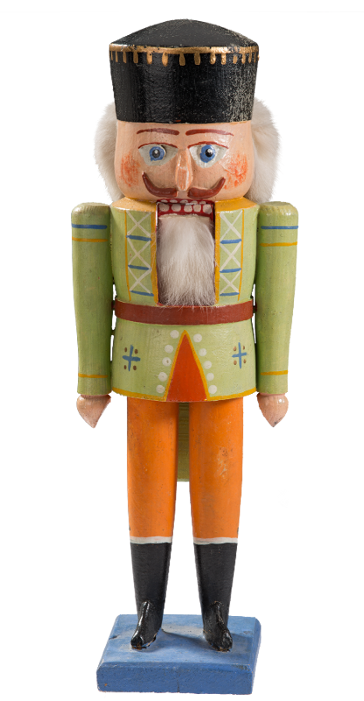 The toymaker Richard Langer (1887-1957) from Seiffen also produced nutcrackers from about 1910. The figure developed by him with a stocky shape, a hat which was cut at an angle and a round button nose has developed into a typical form of its own. Roughly 130 individual work processes and approx. 30 individual parts are need to make a wood turned nutcracker. First of all, the craftsman turns a cylinder of the required diameter on his lathe from a square piece of timber using the “roughing out gouge” and a chisel. Then the notches for the head, neck and coat end are cut with the upper body extending to the end of the coat. In contrast to the historical method of making a nutcracker where the feet and nose were modelled by hand out of bread dough and the nutcracker’s “mouth” was chiselled out of the upper body using a flat chisel, today the arms, legs and base are turned on the lathe and the feet and nose are carved out of pre-sawn wooden blocks. Nowadays the “mouth” is milled out of the upper body. The lever necessary to crack the nuts is cut out using a band saw and attached to the inside of the “mouth” using a strong pin. Once the individual parts have been glued together the figure is then trimmed, primed and sanded down. The colours are then painted, traditionally with distemper colours or poster paints using a brush. Sprayed gloss paint is usually worked with in today’s modern production. Last of all, the beard and hair are stuck onto the figure.